Cozy 2 bedroom cabin on Otter Tail Lake. 100% sand beach and lake. Lake is shallow for about a 1000 feet which means the lake is great for small kids, playing water sports in the lake, and learning to water ski. Cabin was completely remodeled in 2000 with pine walls and ceilings, heated floors and new appliances. Very large deck off the front of the cabin that is as wide as the cabin with large awning. Large level front yard for yard games. Dock extends over 100 feet into the lake. This is truly a cabin, not a lake home, experience. Otter Tail Lake is the 10th largest lake in Minnesota. This lake is never crowded or busy. There is a Zorbaz restaurant on the lake you can boat to. There is a second restaurant that you can boat to as well. The Riviera public boat launch is less than a quarter mile away. Our property extends to Long Lake on the other side of the road. This is as good as it gets. Ottertail County has licensed our property for short term rentals. Ottertail County has officially licensed our cabin for 7 guests. Cindy and I (Mike) live in St. Paul, Minnesota. Cindy grew up in Minnetonka, Minnesota and I grew up in Burnsville, Minnesota. We both graduated from Bethel University in Arden Hills. We were married in 1987 and have 3 adult sons. Our Otter Tail Lake cabin is 2 cabins down from my mom's cabin, which she owns with her sister. That cabin belonged to my great grandfather and has been in the family since 1910. In June of 2000 we started looking for our own cabin for our family. We wanted a cabin that was within 1.5 hours from our home in St. Paul. We searched every lake that was a 1,000 acres or bigger that met that 1.5 hour distance. We could find nothing that we really loved. Then one weekend in August we were visiting my mom at her cabin and saw that the cabin we now own was for sale. We then realized that Otter Tail Lake was what we wanted but just further from home. We decided that the extra 1.5 hour drive was worth it if the destination was exactly what we wanted. We looked at many properties for sale on Otter Tail Lake that weekend but nothing we saw matched the features of our cabin property. We made an offer on our cabin that weekend and closed on it a month later. When we were searching for our cabin, we had these requirements: - On a lake that was 1,000 acres or bigger - A level lot - A sand bottom lake - A sandy beach - A beautiful view - 150' of lake shore (got this, kind of) - A restaurant on the lake that you could boat to - 1.5 hours or less from our home (this we had to give up). Our cabin has all of these things except that it is 3 hours from our home in St. Paul. Though we only have 75 feet of lake shore on Otter Tail Lake, our property also has 75 feet of lake shore on Long Lake. Our property starts at Otter Tail Lake, goes back to the road, then from the other side of the road to Long Lake. I thought it was pretty cool that our cabin was on 2 lakes. I fully remodeled our cabin inside and out in 2000 with everything new. The only things that are original is the foundation and the stud walls and trusses. We even have heated floors. We also have a very large deck with an awning that allows for time on the deck even during the hottest of days. 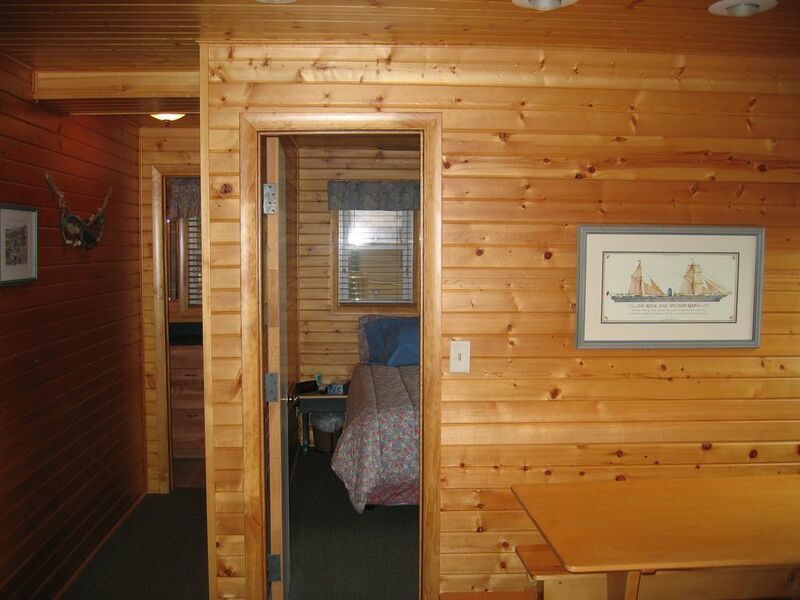 Our cabin is truly cozy and exceptionally efficient with space. Bathroom was completely remodeled in 2013. Bathroom has a heated floor. Our cabin is right on the water. Beautiful level front yard leading to our beach on Otter Tail Lake. 3 sources of heat are available. Furnace, heated floors and fireplace. Large capacity washing machine. New in 2000. Large capacity clothes dryer. New in 2000. Wood burning fireplace. New in 2000. Parking enough for 4 or 5 vehicles. Fully stocked with kitchen utensils. 2 inside dining tables. One of the tables seats 8 the other seats 6. Outside deck tables each are designed for 4. An additional 2 deck tables are available that seat an additional 4 each. 32 inch flat panel LCD TV is mounted to the wall. We do not have cable or internet. We do not get local TV stations. Our thought is that at the cabin, you don't watch TV. TV is for DVD movies. We have a Blue Ray DVD player. We have some games in the cabinet in the back bedroom. We have some DVDs that are in the toy box below the TV. Very large front and back yard. Great for games. We have kept the trees in the front yard to the edge of the property line so to make for a large playing area. Our boat and jet skis are not available. Sorry. We have a large gas outdoor grill. Very large deck on the lakeside of the cabin. There are 2 nearby golf courses. Thumper Pond is about 4 miles away. Balmoral Golf Course is about 8 miles away. There is not a ramp. See pictures to determine if stairs are adequate. I'm sorry but our boat and jet skis are not available. Modern cabin with many amenities, large yard, and beach area. Very nice cabin and furnishings. Property was well maintained. Only disappointment was the boat lift that was not available as expected. Sorry about the boat lift not being available. I'm very happy that you enjoyed the cabin. Great Lake cabin on a great lake! This was just as described. The whole process was pretty effortless! The two bedroom cabin can accommodate 11 but would be tight but if you only plan to be in the cabin to sleep, which if your on a lake Inhope that's you're plan, this would be perfect. The deck and yard are large and enable ample space for hanging out, playing yard games, sun tanning, etc. The cabin was clean and ready for our arrival. If you plan to do any cooking advise you bring your own knives for chopping but other than that we found everything we needed. If you have lots of coffee drinkers as well, there is a two cup maker so just keep that in mind! The Long Lake side where the half pipe isn't really usable - which was fine for us because he Ottertail side provided a modest beach, great, not weedy lake for swimming / wading! Thanks to the hosts for sharing their lake cabin! We probably will be back in touch and have already referred friends!